Military Intelligence “cleansed” the files of Nazi references. By 1955, more than 760 German scientists had been granted citizenship in the U.S. and given prominent positions in the American scientific community. Many had been longtime members of the Nazi party and the Gestapo, had conducted experiments on humans at concentration camps, had used slave labour, and had committed other war crimes. The following February, a new security evaluation of Von Braun said, “No derogatory information is available on the subject…It is the opinion of the Military Governor that he may not constitute a security threat to the United States.” Here are a few of the 700 suspicious characters who were allowed to immigrate through Project Paperclip. But the JIOA’s final dossier on him said there was “nothing in his records indicating that he was a war criminal or an ardent Nazi or otherwise objectionable.” Rudolph became a US citizen and later designed the Saturn 5 rocket used in the Apollo moon landings. In 1984, when his war record was finally investigated, he fled to West Germany. These two, along with Blome, were among the 23 defendants in the Nuremberg War Trials “Medical Case.” Becker-Freysing was convicted and sentenced to 20 years in prison for conducting experiments on Dachau inmates, such as starving them, then force-feeding them seawater that had been chemically altered to make it drinkable. Ruff was acquitted (in a close decision) on charges that he had killed as many as 80 Dachau inmates in a low-pressure chamber designed to simulate altitudes in excess of 60,000 feet. Before their trial, Becker-Freysing and Ruff were paid by the Army Air Force to write reports about their grotesque experiments. It was five years after the end of WW2 but one of Hitler’s chief intelligence officers was still on the job. From a walled-in compound in Bavaria, General Reinhard Gehlen oversaw a vast network of intelligence agents spying on Russia. His top aides were Nazi zealots who had committed some of the most notorious crimes of the war. Gehlen and his SS united were hired, and swiftly became agents of the CIA when they revealed their massive records on the Soviet Union to the US. Gehlen derived much of his information from his role in one of the most terrible atrocities of the war: the torture, interrogation and murder by starvation of some four million Soviet prisoners. Prisoners who refused to cooperate were often tortured or summarily executed. Many were executed even after they had given information, while others were simply left to starve to death. As a result, Gehlend and members of his organization manoeuvred to make sure they were captured by advancing American troops rather than Russians, who would have executed them immediately. Two months before Germany surrendered in 1945, the Gehlen organization made its move. “Gehlen and a small group of his most senior officers carefully microfilmed the vast holding on the USSR in the military section of the German army’s general staff. They packed the film in watertight steel drums and secretly buried it in remote mountain meadows scattered throughout the Austrian Alps. General William Donovan and Allen Dulles of the CIA were tipped off about Gehlen’s surrender and his offer of Russian intelligence in exchange for a job. The CIA was soon jockeying with military intelligence for authority over Gehlen’s microfilmed records–and control of the German spymaster. Dulles arranged for a private intelligence facility in West Germany to be established, and named it the Geheln Organization. Gehlen promised not to hire any former SS, SD, or Gestapo members; he hired them anyway, and the CIA did not stop him. Two of Gehlen’s early recruits were Emil Augsburg and Dr. Franz Six, who had been part of mobile killing squads, which killed Jews, intellectuals, and Soviet partisans wherever they found them. Other early recruits included Willi Krichbaum, senior Gestapo leader for south-eastern Europe, and the Gestapo chiefs of Paris and Kiel, Germany. With the encouragement of the CIA, Gehlen Org (Licio Gelli) set up “rat lines” to get Nazi war criminals out of Europe so they wouldn’t be prosecuted. By setting up transit camps and issuing phoney passports, the Gehlen Org helped more than 5,000 Nazis leave Europe and relocate around the world, especially in South and Central America. There, mass murderers like Klaus Barbie (the butcher of Lyons) helped governments set up death squads in Chile, Argentina, El Salvador, and elsewhere. Known as the Nazi butcher of Lyons, France during World War 2, Barbie was part of the SS that was responsible for the death of thousands of French people under the German occupation. Some of Rupp’s best work was done for the CIA, after he was imported in Operation Paperclip. Rupp has been convicted of bank fraud. He was an operative for the CIA and is deeply involved in the Savings and Loan scandals. A federal jury has indicated they believe testimony that Rupp, the late CIA Director William Casey – then Reagan’s campaign manager, and Donald Gregg, now U.S. Ambassador to South Korea, flew with George Bush to Paris in 1980, during the election in which Bush was on the ticket with Ronald Reagan. The testimony states that three meetings were held on October 19 and 20 at the Hotel Florida and Hotel Crillion. The subject? According to the court testimony, the meetings were to sabotage President Jimmy Carter’s re-election campaign by delaying the release of American hostages in Iran. The hostages were released on January 20, 1981, right after Reagan and Bush were sworn into office. Iran was promised return of its frozen assets in the United States and the foundation for the Iran-Contra deal was set into motion. Head of a 2400 member secret Masonic Lodge, P2, a neo-fascist organization, in Italy that catered to only the elite, Gelli had high connections in the Vatican, even though he was not a Catholic. P2’s membership is totally secret and not even available to its Mother Lodge in England. Gelli was responsible for providing Argentina with the Exocet missile. He was a double agent for the CIA and the KGB. He assisted many former Nazi high officials in their escape from Europe to Central America. He had close ties with the Italian Mafia. Gelli was a close associate of Benito Mussolini. He was also closely affiliated with Roberto Calvi, head of the scandal-ridden Vatican Bank. Calvi was murdered. Gelli’s secret lodge consisted of extremely important people, including armed forces commanders, secret service chiefs, head of Italy’s financial police, 30 generals, eight admirals, newspaper editors, television and top business executives and key bankers – including Calvi, Licio Gelli and others in P2 were behind the assassination of Pope John Paul 1. The central figure in Europe and South America that linked the CIA, Masonic Lodge, Vatican, ex-Nazis and several South American governments, the Italian government and several international banks was Licio Gelli. He, with Klaus Barbie and Heinrich Rupp, met with Ronald R. Rewald in Uruguay to arrange for the Argentine purchase of the French-made Exocet missile, used to devastating effect against the British in the Falkland Islands. Gelli was well connected with the Vatican from the days of the Rat Line and he worked for American intelligence, as well. Gelli formed the P-2 Masonic Lodge-which did not follow the direction of any Grand Lodge-and it was supplied with a sum of $10 million a month by the CIA. Its membership was a Who’s Who in the intelligence, military and Italian community. So prominent was Gelli’s influence, that he was even a guest of honour at the 1981 inauguration of President Ronald Reagan. Gelli used blackmail in order to gain prominent members of his P-2 lodge, its membership is estimated at 2400 members, including 300 of the most powerful men in the Western World.. He was a close friend of Pope Paul VI, Juan Peron of Argentina, Libyan dictator Qaddafi, and many high officials in the Italian and American governments – he is also reported to have had some financial dealings with the George Bush for President campaign. Gelli and his P-2 lodge had staggering connections to banking, intelligence and diplomatic passports. The CIA poured hundreds of millions of dollars into Italy in the form of secret subsidies for political parties, labour unions and communications businesses. At the same time the Agency continued its relationship with far- right and violent elements as a back-up should a coup be needed to oust a possible Communist government. This covert financing was exposed by the Prime Minister of Italy in a speech to Parliament. He indicates that more than 600 people in Italy still remain on the payroll of the CIA. Licio Gelli was an ardent Nazi and a perfect asset of the CIA. As part of Reinhard Gehlen’s intelligence team, he had excellent contacts. Licio was the go between for the CIA and the Vatican through his P2 Lodge. Project Paperclip was stopped in 1957, when West Germany protested to the U.S. that these efforts had stripped it of “scientific skills.” There was no comment about supporting Nazis. Paperclip may have ended in 1957, but as you can see from Licio Gelli and his international dealings with the CIA in Italy/P2, and Heinrich Rupp with his involvement in October Surprise, the ramifications of Paperclip are world-wide. The Nazis became employed CIA agents, engaging in clandestine work with the likes of George Bush, the CIA, Henry Kissenger, and the Masonic P2 lodge. This is but one of the results of Operation Paperclip. Another umbrella project that was spawned from Paperclip was MK-ULTRA. One result of Operation Paperclip was the capture of cutting edge German military technology, such as the Ho-IX. Pictured above being assembled in its German factory, the planes hi tech composite construction was capable of absorbing radar waves. 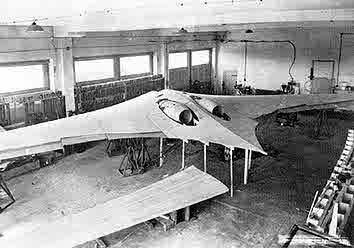 Making it in effect a forerunner of today’s stealth aircraft. 7. Kiss the Boys Goodbye, by Monika Jensen-Stevenson and William Stevenson. 9. In God’s Name, An Investigation into the Murder of Pope John Paul I, by David A.Yallop. 10. The Crimes of Patriots – A True Tale of Dope. Dirty Money, and the CIA by Jonathan Kwitny. 11. Mengele – The Complete Story, by Gerald L. Posner and John Ware. 12. Blowback, America’s Recruitment of Nazis and its Effects on the Cold War, by Christopher Simpson. 13. Jury Says Story of Reagan-Bush Campaign Deal With Iran Is True, San Francisco Chronicle May 5, 1990. 14. Hawaii Scheme Cost Napans $500.000, Napa Register October 3, 1983.